Bring your friends and family (don't forget the Tie Dye!) and join Knoll + Knoll Textiles + Spaces and IIDA Kansas City in support of the Karen W. Gould Fiber Department Project Award! The Gould family has created this award fund as a way to honor Karen's contributions and influence on the design community in Kansas City, and beyond. Karen's affinity for fiber arts began when she was in her teens and continued as she developed her capabilities in batik, weaving, and clothing design. Karen migrated her art career to interior design and produced many award winning projects featured in national publications. 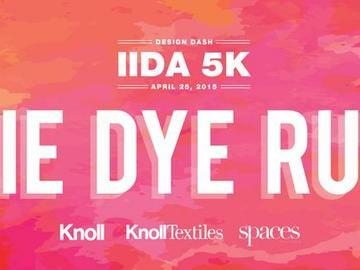 All proceeds from this year’s Design Dash will go directly toward the Karen W. Gould Fiber Department Project Award! Medals will be awarded to ‘Fastest’ and ‘Best Dressed’ individuals and teams… so come dressed to impressed in your fanciest Tie Dye Attire! This 5k Tie Dye Run/Walk will be chip timed through RaceDay Timing Solutions. Free event t-shirt (with each registration or donation), post-race pancake breakfast and prizes for race participants! Visit iidamidamerica.org for more information!